yellow smile icon transformed from the letter "JD", which looks simple, cute and energetic. 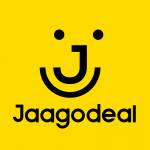 Shop online for Cash On Delivery products on JAAGOdeal.com. Get Free Shipping & CoD options across Bangladesh. JAAGOdeal.com online shopping in Bangladesh cash on delivery. Buy latest electronics, mobiles, fashion apparels. ✓Cash On Delivery ✓Low Prices.